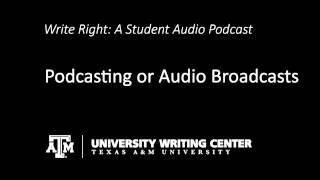 Welcome back to Write Right, the student podcast for the Texas A&M University Writing Center. In today’s episode, we’ll have a quick Q&A session about the process of podcasting itself. How do you get started podcasting? How do you write for a podcast? Listen along, and we’ll answer these questions. First of all, what is podcasting? Podcasts are short audio broadcasts that can be listened to online or downloaded onto an Ipod. They usually incorporate a mixture of music, voice, and sound effects. What different types of podcasts can you produce? Podcasts for educational purposes include anything from instructional lessons to marketing a service. There’s no correct “formula” for creating podcasts. Some consist of a single monologue, while others may be in the form of an interview or skit. The idea is to capture attention with an audio format. What equipment do you need to create a podcast? To record, you can use a microphone with a USB connection that plugs into your computer. You’ll also need recording and editing software. Many programs are free, such as Audacity. How do you begin a podcast? You’ll want to begin by writing a script or creating questions to ask in an interview. Think about your audience as you write, and also keep in mind that communicating orally is very from communicating by writing. Podcasts are casual and conversational, and you’ll often find that you need to revise your script as you read it out loud. Also, think about the pace of your speech, how to emphasize key words, and how to guide listeners with vocal inflection. How do you record the podcast? Acoustically, it’s better to use a medium-sized room that has carpeted or wooden walls and surfaces. As you record, make sure you speak directly into the mic and avoid shuffling papers or tapping pens. If you’re interviewing others, remember not to say anything while they’re talking , even “uh-huh” or “yeah.” And remember, you can always record more than once. With editing, you can cut out stutters, awkward words, or entire sentences. It’s also easy to adjust the volume, speed, and pitch. Adding background music and sound effects can give more life to the podcast, as long as they don’t become a distraction or interference. How long is the ideal podcast? If the podcast is strictly audio, people’s attention span probably won’t last longer than about 4-5 minutes. Podcasts can be a little longer if they incorporate video or a slide show. We hope these tips can be useful if and when you find yourself podcasting. Once you have a little experience, podcasts can be really fun to produce. Thanks for tuning in to Write Right, and have a great day!